I am particularly interested in encouraging children and their families into religious buildings to learn about their religious heritage as part of local culture. Having worked on ways to do this in Norfolk’s churches, I was very interested when I was introduced to Kazz Morohashi and her Go Walkeez project. It uses modern technology, and this will appeal to children who are so used to using i-phones and social media. Kazz is presenting a paper about the project at the CA2RE (Conference for Architectural and Artistic Research) conference at KT Leuven in April, but we thought FRH members might like a preview. ‘Heritage provides the roots to our identities and enriches our lives’ (Heritage Lottery Fund). It is an asset that fosters meaningful connections to inform people of their community’s past and present. This applies to architectural heritage. Whilst buildings of historical significance form part of our urban landscape, there is broad agreement that much of their heritage value remains under-explored, especially by children. The city of Norwich, for example, boasts the largest concentration of medieval churches north of the Alps (Medieval Churches of Norwich Project). Yet, there are currently only a few child-focused approaches to inform children about their significance. 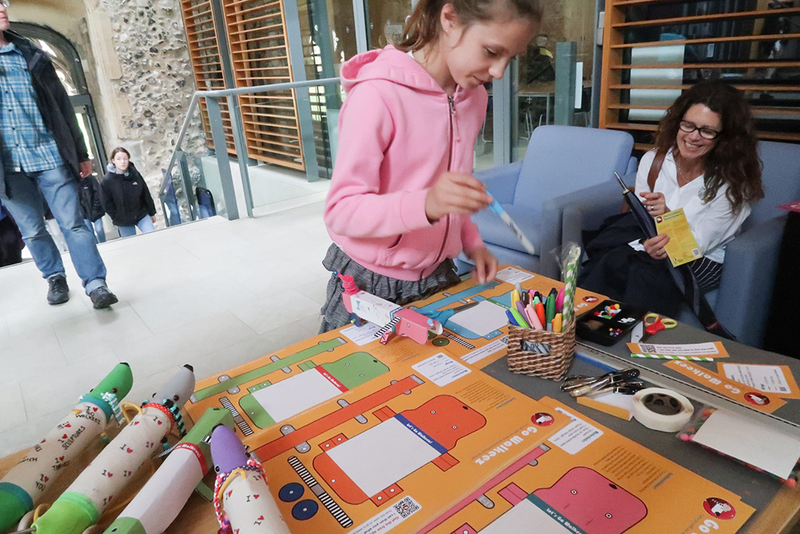 This article presents an applied design approach to cultural engagement employing a system called Go Walkeez and its use as an educational tool through a collaborative project with the University of East Anglia’s Medieval Churches of Norwich Project (MCNP) team. 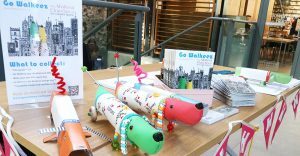 Go Walkeez is a child-focused cultural engagement system and tool that involves children walking a special toy dog and using a mobile app to photograph their experience. MCNP is a research project investigating the history of medieval churches in Norwich. Together, our objective was to establish a link between cultural engagement and cultural learning by using medieval churches as the focus. Go Walkeez is a system developed for children to encourage playful participatory engagement with culture and heritage. The design is a working prototype. The ongoing research investigates Go Walkeez’s usability and adaptability to work in different cultural contexts, such as museums, historic environments and cultural settings. The aim of Go Walkeez is to both engage children with culture and gain insight into their experiences. The toy dog acts as a physical agent to encourage children to actively go out and explore cultural environment. The mobile app allows children to create photographs and evidence their experiences. The dog provides a physical connection to the experience. The wheelable dog on a lead is an object that the child manipulates to deepen the role-play experience. The child becomes the ‘master’ and the dog becomes his/her loyal ‘companion’. With adult supervision, the child is encouraged to train the dog to become a cultured dog through heritage observation. The ‘culturing’ could range from showing the dog what the child finds as being culturally significant to discussing and constructing meanings about history and heritage together with their parents. This action-led real world experience with a physical pull toy generates a playful environment for children to seek and make new connections. The app scaffolds children’s experience by providing open-ended questions to frame their visit. The app produces prompts to focus their interest, such as ‘let’s find a calming spot’ on a church walk, which directs the child to grasp the way architectural space is articulated. The experience prioritises self-discovery rather than didactic learning. The inapp camera provides children with means of documenting their discoveries and marking their achievement of ‘culturing the dog’ by snapping an image of the dog ‘sniffing’ the subject. The dog framed in a ‘selfie’ style photograph provides a fun (and funny) visual feedback to the child to encourage further cultural investigation. The functionality to share these ‘sniffie’ shots using the parent’s or guardian’s social media account helps to evidence their experience to a wider audience, which is rewarded by the in-app dog receiving digital doggie biscuits. One of the key objectives of Kazz’s current research is to test the adaptability of Go Walkeez to work in different cultural contexts. This question responds to the growing urgency for heritage institutions to better coordinate their practices through a network approach (RSA, 2016) and to improve access to culture (ACE, DCMS). Go Walkeez therefore proposes a new approach to access. It is a system designed to drive and excite children to visit a range of heritage institutions. Once there, the children could benefit from the institutions’ existing engagement programmes, which in themselves are carefully crafted and well delivered to fit within their remit. Having trialed the project in a museum context, Kazz was particularly interested in testing Go Walkeez in getting children to study architectural heritage within a built urban environment context. After making a few inquiries, she got in touch with a team of medieval historians at the University of East Anglia who were engaged in a three-year funded research project on medieval churches in Norwich. The Medieval Churches of Norwich Project (MCNP) is a three-year Leverhulme Trust funded project set up in 2014 to investigate the historic and contemporary relevance of medieval churches in Norwich. MCNP studies all 58 medieval churches in the city as individual and collective historic assets. The project’s aim is ‘to articulate the city’s architectural and spiritual landscape through archaeological and archival surveys’ to thereby ‘reveal the interdependent relationship between city, community, and architecture, by which people and places have shaped each other since the early Middle Ages’ and present ‘the artistic, cultural, and social importance of medieval parish churches in England and beyond’. As part of MCNP’s outreach programme, Kazz teamed up with Dr Kristi Bain and Prof Sandy Heslop from MCNP to use Go Walkeez to bring MCNP’s research on the city’s medieval churches to a younger audience. After some discussion, they agreed to develop a children’s walking trail and an accompanying booklet with information on medieval history and churches. Through the trail and trail booklet, our aim was to test the application of Go Walkeez from a cultural engagement tool to a cultural education tool by using MCNP’s research to contextualize the experience and evaluating family feedback to observe the link between engagement and learning. As a trial, Kazz and Kristi ran the trail project to coincide with the Heritage Open Days, Britain’s largest volunteer-organised heritage festival, which has been held annually in September since 1994. The four-day event traces its history to the European Heritage Days to ‘raise appreciation of Europe’s rich and diverse cultural asset’, where ‘historic monuments and buildings in particular that are normally closed to the public’ are open for visits (Heritage Open Day). As a visual marker, the festival organisers produce pink flags, signs and balloons with the Heritage Open Day festival logo for participating organisations to direct visitors. These markers, together with a brochure and website, guide visitors to Heritage Open Day sites, which might otherwise be difficult to identify. Although the Go Walkeez x Medieval Churches trail project was not an official part of the HOD, Kazz’s collaborator produced a series of HOD branded goods on the days of our event. This helped to visually situate them into the activities and gave visitors a clearer idea of where to explore. 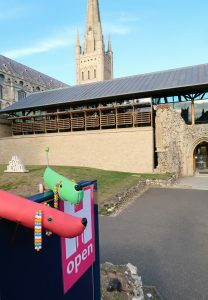 Positioned in Norwich Cathedral’s Hostry, a large multi-purpose space in one of the city’s key historic landmarks, they set up a table to distribute the toy dogs, app and trail booklets. The Hostry, in theory, has free Wi-Fi access, where Go Walkeez users would be able to download the app. The trail project was held over the weekend of HOD on 10 and 11 September, 2016, between 10am to 3pm on Saturday and 11am to 3pm on Sunday. Over the Heritage Open Day weekend, and despite the first day being wet and unseasonably cold, some 20 adults and 25 children took part in the one-mile trail project. The children were all presented with a choice of either checking out a sponge dog or making their own paper dog that they could later take home. All participating children took the sponge dog out for a walk. The outings lasted on average around one and a quarter hours. When the family returned, almost all children made or took home a paper dog kit. Many children named their dog. In terms of engagement experience, both children and adults responded to our questionnaire with positive feedback and that they would repeat the experience. Most of the children and adults had something to say about certain medieval architectural features or history that they found particularly interesting in their feedback, details which correlate to the information given in the trail booklet. Most were local participants and had heard about the event through Facebook. One of the key challenges was promoting app download. Despite promoting the app ahead of time and on the day with a direct download link and a QR code, the download challenge was more than expected. As an alternative but similar experience, parents were encouraged to use their mobile device’s camera, rather than access it through the app. The only disadvantage to directly accessing the device camera was that the app took stock of the photos taken and number of images shared, which rewarded the user with digital doggie biscuits that the user can then feed to the in-app dog. One of the unexpected responses came a few days later in an email. It was from a mother whose child was born with a physical condition that limited her mobility. The child had recently undergone corrective surgery, but was hesitant to walk for any prolonged period of time or distance; however, the mother wrote to report how pleased she was that the project encouraged her to walk of her own accord and for nearly two hours. According to her, this was the longest time she had wanted to walk and felt that a project like this would benefit communities where mobility or outdoor experiences are an issue. While the number of participants was relatively small (20 adults, 25 children), the trial feedback suggested that providing a child-focused engagement tool which combines the use of a physical object to manipulate and digital technology to document children’s discoveries offered a more rewarding and enriching experience for the family as a whole. Positioning the child as the ‘cultural leader’ promoted learning through role-play and social interaction between the children and parents (and other adults intrigued by children pulling a sausage toy dog). User responses suggested that knowledge on medieval churches and history was gained through the experience. Work on Go Walkeez is on-going in religious and other setting. I very much welcome FRH members’ feedback, and would like to ask members in the FRH community interest in Go Walkeez to get in touch. Go Walkeez is a design tool that appeals to young children and would offer a valuable way to encouraging families to learning more about their local culture, and in particular their religious heritage. Arts Council England (no date). The Cultural Education Challenge [online]. Available at: www.artscouncil.org.uk [Accessed 12 Dec, 2016]. Department for Culture, Media and Sports (2016). The Culture White Paper. London: DCMS. Heritage Lottery Fund (no date). ‘The Value of Heritage’ in About Us [online]. Available at: www.hlf.org.uk [Accessed 30 January, 2017]. Heritage Open Days (no date). History [online]. Available at: www.heritageopendays.org.uk [Accessed 12 December, 2016]. Medieval Churches of Norwich Project (no date). About Us [online]. Available at: norwichmedievalchurches.org/ [Accessed 7 Jan, 2016]. Royal Society for the encouragement of Arts, Manufactures and Commerce (RSA)(2016). Networked Heritage: Heritage is central to how places feel and function [online]. Available at: medium.com [Accessed 16 Dec, 2016].